I want to preface this review by saying: if you are planning on reading Crossed, I would HIGHLY reccommend re-reading Matched. I found that a great deal of the problems I had with Crossed centered around not remembering a great deal of the plot of the first book. This was a pretty decent sequel. The author has a great way of keeping your attention and keeping an aura of expectation about her novels. I am constantly wondering what is going to happen next. I was a little confused with the style the author chose to write this book in. I don't seem to run into many books that are written in the present tense, and I have to say- I don't really like it. I found it to be a little confusing and distracting. I was also confused by the sudden changes in who was narrating the story. I think I would have liked it more if Cassia was narrating the entire story- I found myself reading and being confused. I then would have to flip back to find out WHO I was reading about. I also found it a little disappointing that there was very little interaction between the two main characters- as someone who really loved the relationship between Ky and Cassia, I felt a little as though this novel was a placeholder book. Most of the story was about Cassia and Ky's separate journeys. Ky was trying to escape, believing that Cassia was still in the Society. Cassia was following Ky and trying desperately to find him. There was a lot of conversation in this book and at times, it seemed to drag. I enjoyed the side characters that were introduced- especially Indie. She was a very spunky character that felt needed. The last 50 pages of this book started to redeem the story for me. I wish that a third of this book would have been trimmed- the book didn't seem to get action packed until the very end. All in all, this was a decent sequel and I look forward to reading the third book for more action and less conversation. This was stop 2 on the Blog Tour- if you would like to check out stop one or check out the rest of the blog tours offered by Good Choice Reading- head over to their Current tours page. 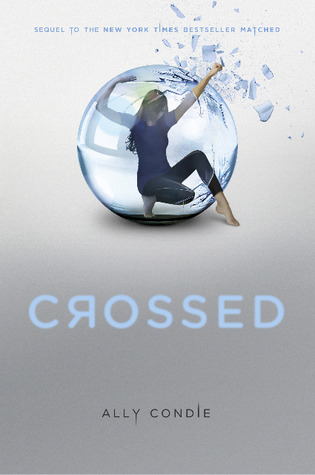 Are you excited to read Crossed for yourself? Great review, it's frustrating sometimes when you don't know who's narrating. I had that same problem in Bumped by Megan McCafferty!